This mod adds the Mane 6 as companions with the use of CaCW's Pony Race. There are no quests associated with them, because I'm too lazy and plus Fallout 4's out. So I'm not putting too much effort into this. 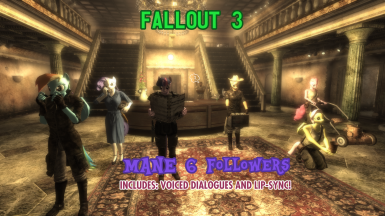 The mod features fully voiced companions with lip-sync included! So that should count for something, right? Extract contents into your "DATA" folder. Delete any plugins that start with "CaCW - ..."
Q2: Wat teh flying pig s**t is this s**t. Ponies? You f**king piss of s**t, go die in a fire you kanzer. 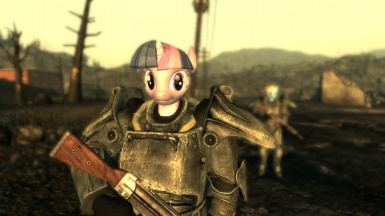 A3: Make sure you install Crimes Against The Capital Wasteland. Q4: Will you make a New Vegas? Q5: Can I have multiple companions at once? A5: Yes. Because I was too GODDAMN LAZY to try and program in a companion limit, you could have multiple CaCW Companions at once. Q6: Can I reuse the sound clips? A6: Sure. Just make sure to credit me and my sources. Q7: Can I upload a modified / fixed / improved version of this mod? A7: Sure, just give me credit for the original mod. A8: We all have it, jackass. Get used to it.